Infinity Remix is a multi-functional clean WordPress theme with a simple and unique design that displays the content in a stylish and traditional way. 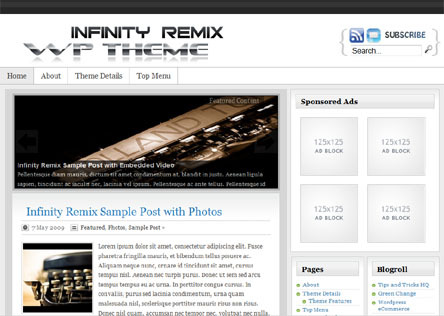 The Infinity Remix theme has a unique home page, consisting of a featured posts section, a blog module and lots of stylish widgetized spaces. The WordPress theme is Light and clean so it loads quicker in the browser. Standards Compliant (has Valid XHTML + CSS code to the search engine bots can index content easily). Fixed width, two columns and the sidebar is on the right side. The Infinity Remix theme was designed keeping all the above points in mind. I tried to keep the structure clean and organized. This theme is perfect for anyone who wants their WordPress blog to stand out in the crowd as this theme has a professional and elegant design. Every theme needs a little tweak here and there no matter how good it looks. If you need a few tweaks or additional stuff just leave a comment below or post it on the support forum. Please note that this theme does not have admin options and is not ideal for anyone who does not want to manually edit the template files for any design tweaks you may need. We are not selling this theme any more. Please check our projects page to find out alternatives (we have developed a few child themes that you might like). @Lionspaw, You can use the theme on as many sites as you own and operate. If you want to use this on client sites they will need to have their own license. Same question as Malika, number 46. Can we use it the plugin on unlimited personal domains? I’m still discovering some of the differences between Joomla and WordPress, and I’m still not quite sure whether certain features in WordPress are ‘WordPress driven’ or ‘theme drive’, so I apologise if this question seems like it should have an obvious answer. Do all the pages have to have a sidebar, or can some pages fill the whole width of the theme? Maybe this is a difference between a Page and a Post? If I can have some pages where I can utilise the full width, then this will be perfect for me along with the e-store plugin. Awesome Theme. Clean and minimal but professional. Hi, I have just installed your theme in place of a previous them. All my page links which were in the footer ended up as links on the nav bar. I would like to know how I can delete some of these links from the nav bar since there are too many and it all appears over crowded. ps you can see the problem in the website listed above. I was looking to go for the infinity remix premium word press theme but I was ignorant of its feature so was hesitant on using this theme, but after going through this post I come to know the features of this theme and decided to subscribe for this theme. The best feature of this theme is that it is compatible with all most all browsers particularly with IE and FIREFOX which are used mostly all over the world. Moreover price charged is not high so definitely like to have this theme. @Kym, the code for the header is in a file called “header.php”. The code for the footer is in a file called “footer.php”. you will have to edit those files to do the changes. I am guessing you just want to replace the header image? Replacing the image is pretty easy. Go to “images” folder of the infinity remix theme and find the “logo.png” file. You just create your header image and give it the same name then overwrite the existing one and that should do it. Hi – can I have directions to change the header and footer please? I assume I need to upload the header and footer to the media library and then use the urls in the header and footer.php files – is that right? and if so – which bit am I replacing with the actual new url? and what is the right size for the header and footer width etc? You just add in a Text Widget then place your newsletter code. Are you able to install a email newsletter opt in above the 4 advertising blocks? Infinity remix theme does not put any Title in the header so not sure where that is coming from. Have you customized the header? Please post a link to the actual site so I can view the HTML code. How do I get rid of this text at the very top of the Infinity Remix theme? Not sure I fully understand the issue. Can you please post a link to the page so I can see what the issue is? Hi, I’ve installed the theme and it works great ! I put some audio galleries on some posts and it works fine but when I want to display the categories, I only have to source code and the players don’t display. So I disabled the categories but it’s the same problem with the tag cloud. Does this mean that I have to disable the tag cloud as well or is there anything I can do to have the players displayed in these pages ? Hi, Infinity Remix does not have a Admin option to change the header information. You will need to edit the PSD that is included with the theme. I have installed the Infinity Remix theme but I could not find the option in the wp-admin area to change the “Infinity Remix Wp Themes” to my own website name. Could anyone share their view on this? Thanks. Hmm.. I am not sure abut the whole right to left thing.. I am not sure what needs to happen special for a theme to handle left to right.. sorry. How does your blog look when you use any other theme? Does the “Infinity Remix Theme” is RTL (right-to-left) ready? I wish to upload it for an Hebrew website. If it does support RTL, can you please send examples? Have a look in the “footer.php” file and customize it as necessary. Ivy, thanks for your prompt and friendly response. I’ve solve the problem, the default logo is showing now, so i’m working on my custom one. Hi, Can you please send me a link to where this issue is happening. ?